Legends of the game: Djokovic with Federer in Chicago. Jack Sock and Kevin Anderson saw off Roger Federer and Novak Djokovic 6-7 6-3 10-6 in the Laver Cup doubles to give Team World their first point of the tournament in Chicago. Excitement had been building ever since it was announced the former world number ones would pair up for Team Europe in the competition’s second year – with the blue side hoping to take a clean sweep into the weekend after a trio of singles wins earlier in the day. Federer and Djokovic took a while to settle into the four-man format, the latter – on the back of his singles US Open triumph and 14th grand slam title – accidentally hitting his partner with the ball in the third game. The Serbian and Swiss both laughed off the incident to the amusement of the crowd and went on to clinch the first-set tie-break 7-6 (7/5). But their opponents soon found their rhythm, taking the second set 6-3, with Sock’s experience as a three-time doubles major champion shining through on some impressive volley shots and Anderson displaying a strong serve. The foursome went toe-to-toe in the early stages of the last set, but having seen their team-mates lose in two deciders earlier in the day, Sock and Anderson made sure not to waste their opportunity when Federer doubled-faulted at 4-4. An impressive return winner from Sock sealed the set 10-6, giving captain John McEnroe a little relief before day two. The doubles game followed three singles matches earlier in the day – Bulgarian Grigor Dimitrov putting the first point on the board for Europe after beating Frances Tiafoe 6-1 6-4. Britain’s Kyle Edmund, a Laver Cup debutant, claimed an impressive 6-4 5-7 10-6 win over Sock and match three saw Belgium’s David Goffin add to Europe’s advantage as he beat Argentina’s Diego Schwartzman 6-4 4-6 11-9. Schwartzman had looked to threaten Europe’s lead with a second-set comeback, and dug deep at 5-1 down in the last to level at 7-7, but Goffin remained calm on his first match point to cheers and hugs from his team-mates and captain Bjorn Borg. Team Europe now lead 3-1 with two points up for grabs on day two. New partnership: Roger Federer and Novak Djokovic will play together on Friday night. 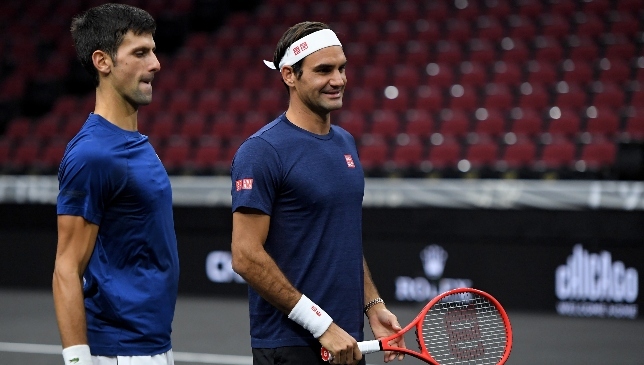 Roger Federer and Novak Djokovic are set to team up and play doubles together on the opening night of the Laver Cup in Chicago on Friday. It is the pairing we have all been waiting for and Team Europe captain Bjorn Borg has ‘dual-ly’ delivered. Like last year, which saw Federer and Rafael Nadal unforgettably star on the same side of the net, two of the all-time greats will again put on a one-off spectacle under the lights of the United Center against Team World. Organisers of the event, played in honour of living legend Rod Laver, who was integral in the early part of the sport’s Open Era, in which players became professional, have been savvy with their marketing, media and promotion work. And a Federer-Djokovic doubles pairing is the ultimate ticket to kick-off the Davis Cup-style event. 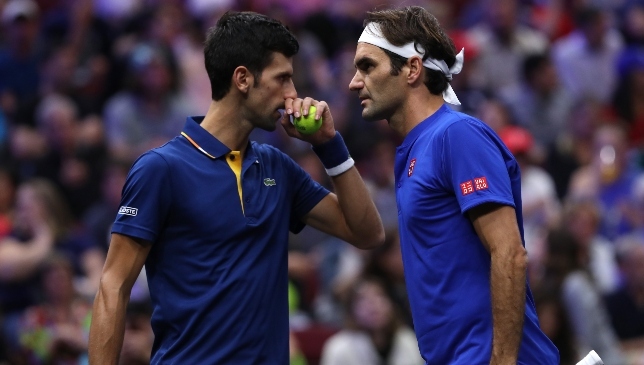 With a collection of 34 Grand Slam singles titles between them (Federer – 20; Djokovic now 14 following back-to-back Wimbledon and US Open triumphs), there has always been plenty of respect between the two players, but it is fair to say they have never been the closest or certainly the best of friends. The Serbian’s former coach Boris Becker said the two players “don’t really like each other” in his 2016 book Wimbledon: My Life and Career at the All England Club, and while Federer played those claims and others down, their rivalry has been intense and not enjoyed the same pleasantries as Federer and Nadal have experienced on and off the court. That said, it is difficult to get along just fine in an individual sport like tennis where the stakes are high and meetings are often career defining. Behind the jokes, laughter and friendship we have seen between Federer and Djokovic in the past couple of days, their overall rivalry has been quite the opposite and very intense. Certainly, in essence, Djokovic has been able to get into Federer’s head more often than not and probably inflict some of his most painful losses. Djokovic won the last of their 46 meetings in August’s Cincinnati Masters final, helping him to build a 24-22 winning head-to-head. Thirteen of those victories have come in finals, to Federer’s six, inclusive of three Grand Slam final victories for the Serb (Wimbledon 2014 and 2015, US Open 2015) compared to the Swiss’s solitary title at the 2007 US Open. The substance to these encounters has been sublime, with Federer’s mix of attacking play, domineering forehand and classical style contrasting to Djokovic’s brickwall return, consistency to get balls back and staying power in the big points. There is no doubt this has been the most eye-catching match-up out of all the ‘Big 4’ clashes, which is why it will be intriguing to see how two right-handers balance out tactically on the same side of the net. Nadal and Federer had their problems last year, with the notable one being when the latter was forced to duck and get out of the way after the Spaniard had called for an overhead. Nevertheless, they clung on for a 6-4, 1-6, 10-5 triumph against Jack Sock and Sam Querrey. Sock will again be on the other side of the posts to Federer this time around but will have the giant Kevin Anderson, who Djokovic defeated in this year’s Wimbledon final, on his side. Federer and Djokovic know each other’s games inside out but there is no doubt they will sit with skipper Borg and formulate tactical plans given they have never played in the doubles area together before. It is new terrority but fascinating new ground all the same. Let the games begin. 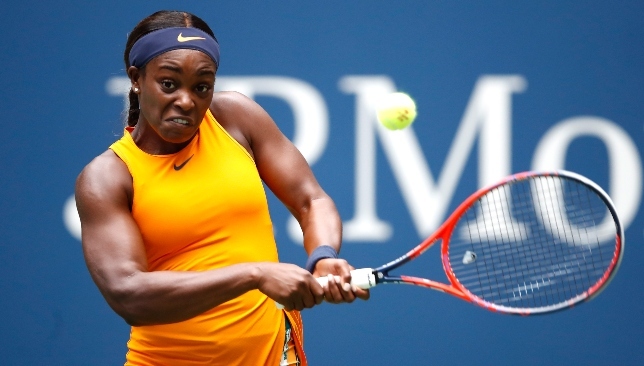 Defending champion Sloane Stephens is the sole remaining top-six seed left in the women’s singles at the US Open after a day of upsets at Flushing Meadows. Wimbledon champion Angelique Kerber and fifth seed Petra Kvitova both fell on Louis Armstrong Stadium, which is rapidly establishing itself as a graveyard of champions, while sixth seed Caroline Garcia also lost. Kvitova was the last victim of the day, the two-time Wimbledon champion overpowered by the hottest player of the moment: 20-year-old Aryna Sabalenka. The Belarusian was not ranked highly enough to get into the tournament 12 months ago but has soared into the top 20 and won her first WTA Tour title in New Haven on the eve of the tournament. The Czech has won five WTA titles this season but only four matches across the four grand slams. She said: “The French Open I was a bit tired. The Australian Open and Wimbledon were similar, I didn’t really play fearless, I was a bit passive and I didn’t have the confidence that I needed and I put a lot of pressure on myself. Top six seed: Sloane Stephens. Kerber’s exit, joining Simona Halep and Caroline Wozniacki, means there will be four different grand slam champions for the second year in a row. Kerber was the last woman to collect two slam titles in a season, winning the Australian and US Opens in 2016 before a dramatic slump last year. She has been resurgent under the guidance of Wim Fissette, capped by her brilliant victory over Serena Williams at Wimbledon, and had reached at least the quarter-finals at the previous three slams. But here she found Dominika Cibulkova a step too far, the Slovakian winning 3-6 6-3 6-3. While the other big names fell around her, Maria Sharapova remained the queen of the night session, extending her perfect record with victory over Jelena Ostapenko. The 2006 champion has played 23 times under the lights at Flushing Meadows and won on each occasion. She got a helping hand this time from 10th seed Ostapenko, last year’s French Open champion, who hit 40 unforced errors in just 17 games to go down 6-3 6-2. Sharapova said: “I don’t remember how old I was when I played my first night match, but I’m sure I was young enough to still be intimidated by the city and the lights and the atmosphere, the noise, as anyone that’s quite young would be. Cibulkova next plays last year’s runner-up, Madison Keys, who avoided an upset by fighting from a set down to defeat Aleksandra Krunic 4-6 6-1 6-2. Another upset saw Cincinnati champion Kiki Bertens beaten 7-6 (7/4) 2-6 7-6 (7/1) by Czech teen Marketa Vondrousova. Vondrousova next faces Ukraine’s Lesia Tsurenko, who followed up her victory over Wozniacki by beating Katerina Siniakova 6-4 6-0. Naomi Osaka has been the most efficient player over the first three rounds and the 20-year-old Japanese-American, who next meets Sabalenka, blasted her way into the last 16 of grand slam for only the second time with a 6-0 6-0 victory over Aliaksandra Sasnovich.